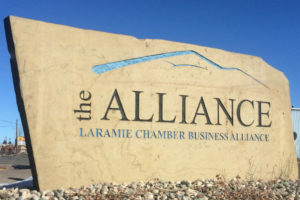 February 2018 (Laramie, WY) – Pence and MacMillan law firm was nominated by the Laramie Chamber Business Alliance (LCBA) as 2017 Small Business of the Year. Also nominated by the LCBA was Megan Goetz of Pence and MacMillan, as 2017 Business Person of the Year. The Small Business of the Year Award, in which Pence and MacMillan is a nominee, recognizes and honors businesses that have demonstrated “Best Practices” of entrepreneurship, such as sound business planning, fiscal responsibility and work process innovation in operating their business. Nominees must exemplify commitment to free enterprise and entrepreneurship. In addition to the firm’s nomination, Pence and MacMillan partner Megan Goetz is a nominee for the Business Person of the Year Award. This award honors and celebrates exceptional service by an individual who has positively contributed to the quality of life in Laramie. That individual has consistently demonstrated a high level of community involvement through participation in civic, community, and active leadership roles for employees, peers, and citizens of Laramie. Pence and MacMillan provides quality legal services to a diverse client base around the country from its home in Wyoming, with offices located in Laramie, Cheyenne, Sheridan, and Lander. Their services include civil litigation, criminal law defense, family and probate law, business and financial law, Medicaid/Medicare law, real estate and landlord laws, municipal and governmental law, labor and termination law, oil and gas law, and more. Their attorneys have diverse practices and expertise, and take great pride in the legal services provided to the people of Wyoming. Goetz is a member/partner of Pence and MacMillan, and serves clients most recently in the areas of civil litigation and transactional law, though has a background in domestic, juvenile, and criminal law as well. With a strong commitment to community service, Goetz serves as a leader in the local and state legal community. She serves on the Wyoming Business Council board, past LEDC chair, Rotary member and past president, Ivinson Memorial Foundation, and past Grande Le Fleur chair. She was very instrumental with the development of Cirrus Sky Technology Park and assisting the Laramie Country Club. Goetz is also involved with numerous professional associations including Wyoming Trial Lawyers Association, Wyoming State Board of Law Examiners, and Albany County Bar Association. Winners of the 2017 Laramie Chamber Business Alliance Awards will be announced at the Annual Membership Meeting & Banquet on February 15 at the UW Conference Center.